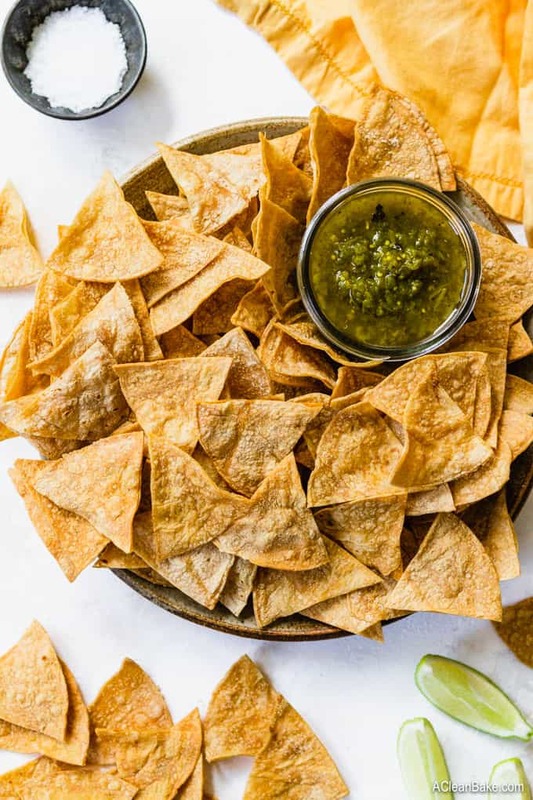 Once you’ve tasted homemade, restaurant-style gluten free tortilla chips, you’ll never reach for a store-bought chip again! These chips are sturdy and crisp, ideal for dunking, and salted to perfection. Plus, they are baked, not fried! 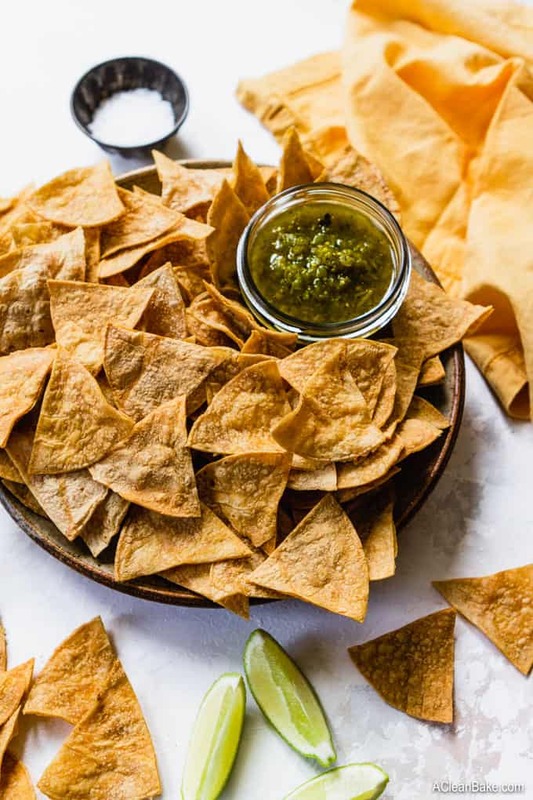 One of the best ways to impress party guests – whether you’re attending a Superbowl party or hosting a barbecue – is to bring a big platter of homemade gluten free tortilla chips cozying up to a vat of homemade guacamole. 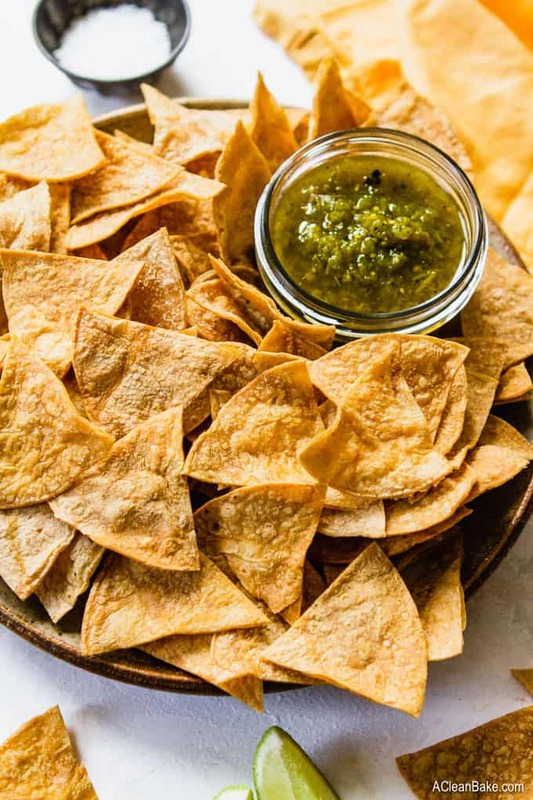 This is one of my best party-hosting and -attending secrets because homemade tortilla chips taste so amazing, but take almost zero time and effort to prepare. 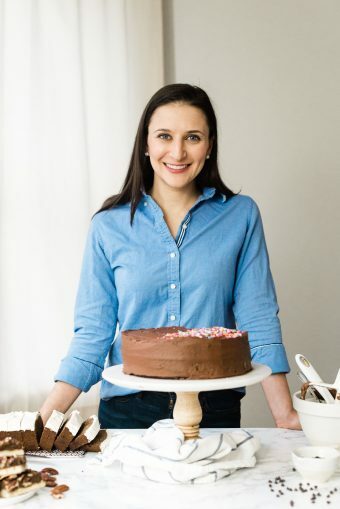 One of the most common questions/concerns I hear from people just starting a gluten free diet is about missing out on their favorite foods. Well, if you’re a crunchy/salty snacker, you need your chips! And I’ll bet tortilla chips are something you’re familiar with from your pre-gluten-free life. Isn’t it kind of comforting that you can still have some of your old favorites? Why not just open a bag of Tostitos? Well, that question answers itself, but there are good quality gluten free chips brands out there like Food Should Taste Good brand tortilla chips, and it might be tempting to just skip the process of making your chips but please don’t. The payoff for just a tiny bit of work (slicing, brushing with avocado or olive oil, sprinkling with salt, etc. Really light work, I promise) is a lighter, un-fried chip that is crisped to perfection and salted exactly to your preference. These chips are thick and hearty, like restaurant style chips, and if you try them, warm, straight from the oven, you’ll never look at another bagged chip. Tortilla chips require no special ingredients to make, not even to make them gluten free. 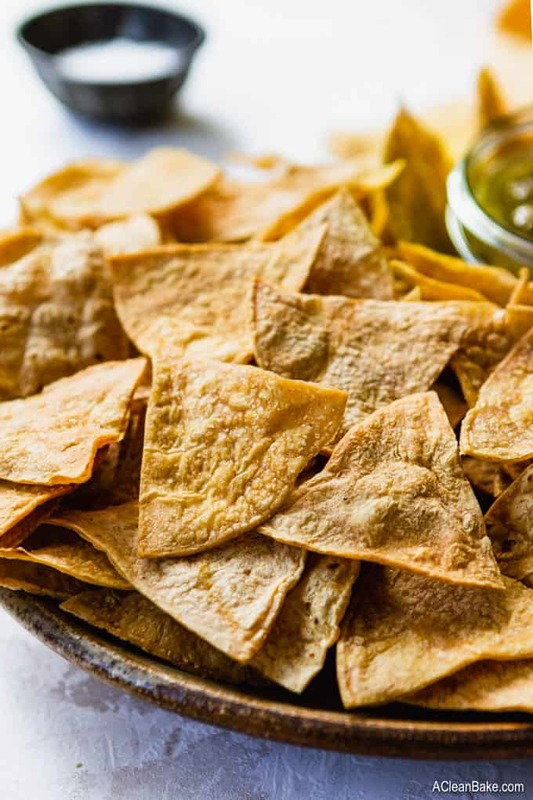 Gluten free tortilla chips are just corn tortilla chips made from – you guessed it – corn tortillas. Your local grocery store sells corn tortillas next to the flour tortillas in the “ethnic” or Hispanic food aisle, and they are usually dirt cheap. Here in Chicago, yellow corn tortillas are locally made and go for about $0.75 per package. You can’t beat that. But don’t just grab corn tortillas; make sure you read the ingredients carefully to ensure they are gluten free. Some of the larger brands sell “corn tortillas” that are made from a mix of corn and wheat flour. Even if your tortillas don’t contain gluten ingredients, depending on how severe your gluten sensitivity (or if you have celiac disease), you may need to stick to a certified gluten free tortilla to avoid the risk of cross contamination. Once you’ve acquired your package of gluten free tortillas, you’ve done about 80% of the work. The rest of the process just involves preheating the oven, cutting up some tortillas, and garnishing them with oil and a little bit of sea salt. Bake until crispy, and you’re done! Now you just have to make the agonizing decision about which dip gets the privilege of being served with your tortilla chips. Well, everybody loves homemade guacamole or salsa. That’s a no brainer; those are classic tortilla chip pairings for a reason! I also like making nachos or chilaquiles – both of which are old favorites, but which I, shockingly, do not yet have recipes for on this site! I’ll have to remedy that soon. Ranch dip: do NOT buy the ready-made stuff. You can make a healthier version by combining sour cream or full fat Greek yogurt with an all-natural ranch seasoning mix (I love Penzey’s mix). Mexican bean dip, if you tolerate beans. This dish can be a repository of disgusting, processed ingredients and unhealthy fats, but there are also some really healthy versions out there. Salsa, which we already covered above… but that was the homemade one. I also highly recommend store bought salsa in a pinch – just make sure to read the ingredient label carefully. My current favorite is Frontera brand Tomatillo Salsa. This is not sponsored, by the way. I just love the flavor of this salsa, and it is made with all real food ingredients. Plus, don’t forget to think outside the dip! 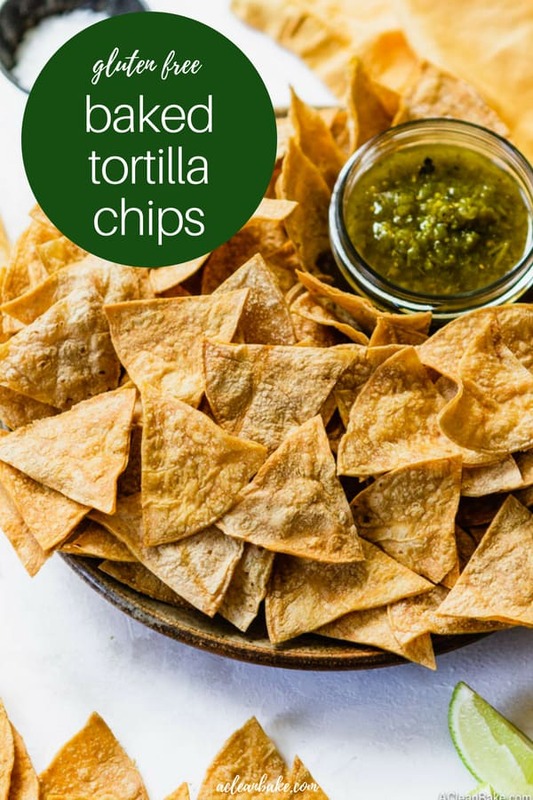 You can serve these with really any Mexican food dish that you need tortilla chips for. Get creative! Oh, and by the way, if you’re looking for a grain free replacement, try my grain free pita chips! 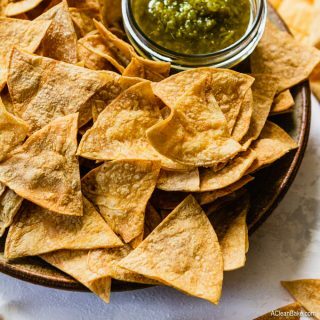 Once you've tasted homemade, restaurant-style gluten free tortilla chips, you'll never reach for a store-bought chip again! These chips are sturdy and crisp, ideal for dunking, and salted to perfection. Plus, they are baked, not fried! Preheat the oven to 400°F. Line two baking sheets with tinfoil or a nonstick pad and set aside. Arrange tortillas in a single pile on a cutting board. Cut the pile in half, then cut each half into thirds. You should get 6 small triangles from each whole tortilla. Arrange the tortillas in a single layer on a cookie sheet. Make sure they don’t overlap, or they will stick together. Thoroughly brush or spray the pieces with oil, then sprinkle the salt over the tortillas. Bake for 14-16 minutes, until golden brown. They will not be very crispy when they are done baking. Remove chips from the oven and cool completely on the cookie sheet. They will crisp up as they cool. 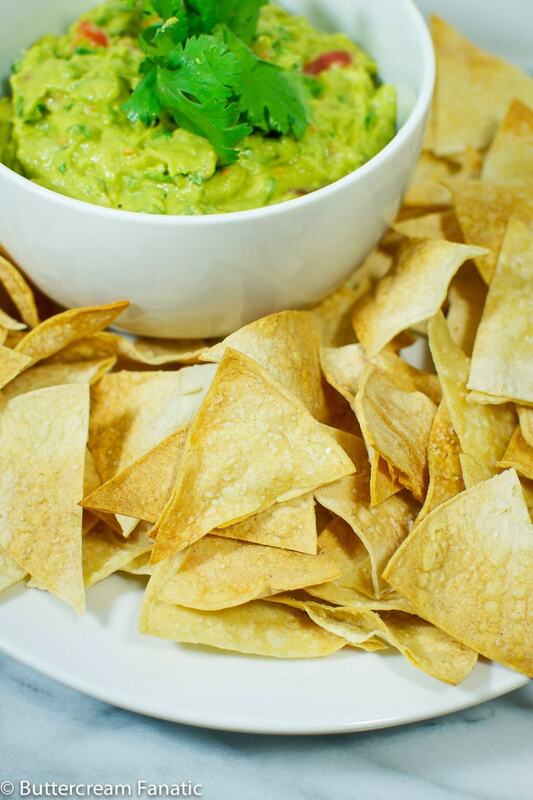 Serve immediately with guacamole or your favorite dip. Recipe can be multiplied as needed. If you like your chips salty, you'll need to double the salt. Store leftovers in an airtight container at room temperature for up to three days. You can store them for longer, but they may get stale more easily than store-bought chips.